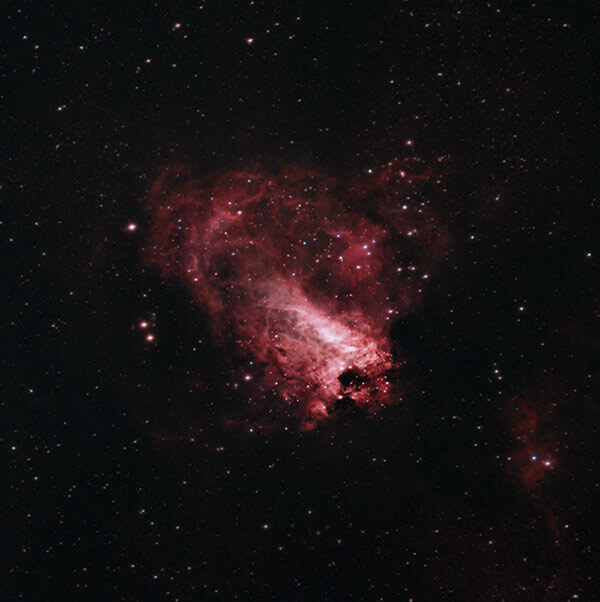 The Omega Nebula (Messier 17) is one of several brilliant deep sky astrophotography targets located in Sagittarius. M17 (Also called the Swan Nebula) is an H II region nebula that lies between 5000-6000 light years from Earth. M17 is a star factory sculpted by stellar winds and radiation. Because of M17’s high surface brightness of the Omega Nebula (apparent magnitude of +6), it is observable through a small telescope. From my light polluted backyard in the city, the Omega nebula appears as a distinct grey smudge through my 22mm eyepiece. Capturing this object using my DSLR camera reveals the rest of the story through long exposure photos. The image above was captured using a modified Canon Rebel T3i DSLR through an Explore Scientific ED102 refractor telescope. A light pollution filter (City light suppression) was used (Skytech CLS-CCD) to help ignore much of the unwanted glow from my Bortle Class 8 skies in the middle of town. This image was the subject of my review of the SkyTech CLS-CCD light pollution filter. The UV/IR block element of this particular filter keeps stars small and prevents bloating. I later combined data acquired using a stock Canon DSLR for a more accurate background sky and star color. Below, you’ll see the difference between images of the Omega Nebula using a stock DSLR camera vs. a modified camera that has had the default internal IR filter removed. If you are looking to modify your DSLR for astrophotography, I recommend using Hap Griffin’s modification service. 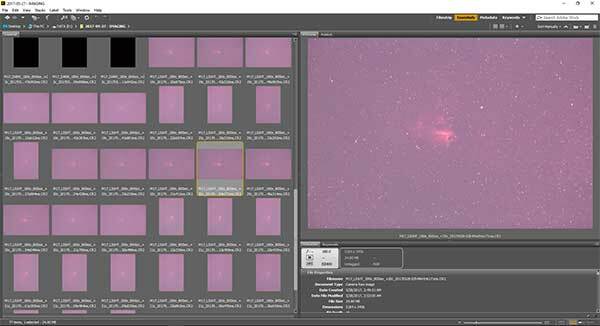 M final image of M17 includes 30 x 3-minute subs using ISO 1600. The imaging session was controlled using Astro Photography Tool. The complete photography details for this image including the list of equipment used are listed below. This nebula includes an H II region where star formation has recently taken place. 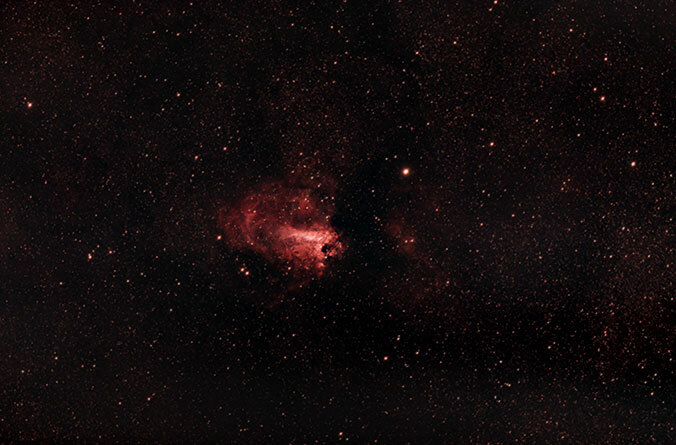 The Omega Nebula rises high enough from my latitude to start imaging in early April if you’re up late enough. 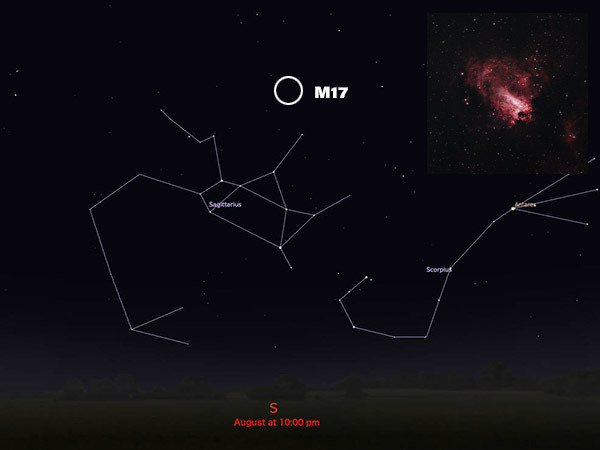 It’s always exciting to see M17 for the first time in the year, as it marks the beginning of Milky Way season for stargazers. For those of you that use your telescope in a city backyard, you’ll be happy to know that M17 is one of the highest objects in Sagittarius. In June and July, it rises high enough in the sky to clear the tall trees and neighboring houses from my backyard. 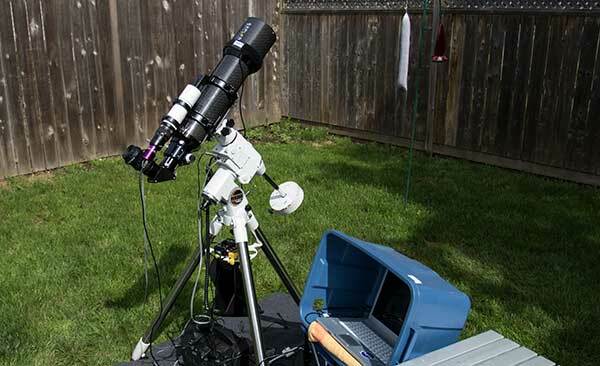 In late May of 2017, I set up my refractor telescope on the far side of my backyard for a low view of the South Eastern horizon. The Omega Nebula rises higher than some of my other favorite targets in Sagittarius such as the Lagoon Nebula. The night of this astrophotography session was clear yet hazy. I think that the transparency of the air affected the quality of my stars in the image. Regardless, I am delighted to photograph such an incredible nebula from the comfort of my backyard. My Canon 600D DSLR has been modified for astrophotography, known as a “full spectrum modification”. 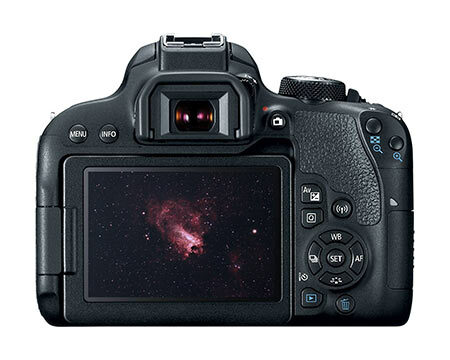 This process opens the CMOS sensor of the Canon T3i to all wavelengths of light, including the bright reds found in emission nebulae such as the Omega Nebula. 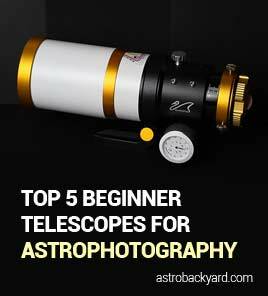 When a modified DSLR is used with a refractor telescope or camera lens, it is essential to use a UV camera filter or an IR filter. The SkyTech CLS-CCD filter was used on my Canon DSLR for my image of M17. This filter also improves the contrast between the astronomical object and the background sky. Filters such as the CLS-CCD are a great option for backyard astrophotographers looking to block out light pollution, without sacrificing any of the “good” light. Bottom Line: An IR filter blocks wavelengths of infrared light that do not focus at the same point as visible light. The version of M17 below is a wide field view through my 102mm refractor. This should give you a good indication of the scale you can expect with similar equipment. This photo shows some of the odd gradients in the background sky due to my imaging conditions. Collecting more light in favorable conditions would help correct this. I’d also like to add some H-alpha data to my photo for an HaRGB composite. The nights are very short this time of year, with daylight beginning to show itself in my image subs by 4am in the morning. This short imaging window creates a sense of urgency to get up and running as fast as possible. The stars got a little “chewed” in the processing, something I have been trying to be aware of lately. I have a habit of focusing on the detail of the nebula while turning a blind eye to the surrounding space and stars. To be honest, 90 minutes is not nearly enough to really start processing a deep sky image. Add the poor imaging conditions, and a hot night, and you’ve got a challenging task of stretching and smoothing your data in Photoshop. I was starting to get used to the cooled sensor of the ASI071MC-Cool, and now completely see the obvious benefits over a regular CMOS sensor. This camera has been returned to Ontario Telescope and Accessories, so I am again focusing on maximizing my results using the Canon 600D.